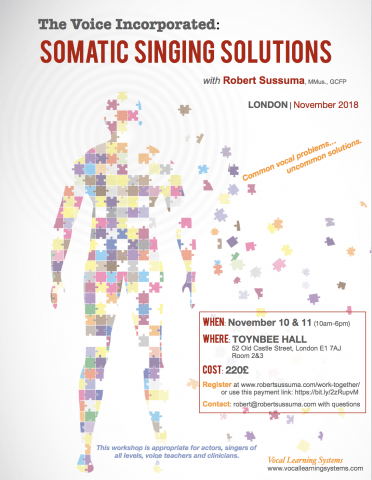 Location: Toynbee Hall - 52 Old Castle Street, London E1 7AJ, "Room 2 and 3"
This special voice and Feldenkrais® (The Feldenkrais® Method) workshop will approach common vocal problems from a somatic point of view. Using gentle movements, sounding as well as some singing, we will explore the systemic underpinnings that are the foundation of all postural and vocal habits. We will also work with specific vocal anatomy within the context of the whole self. By working both directly and indirectly, the voice and, more importantly, the experience of voicing changes – as if by magic. This, in turn, leads to easier overall functioning and greater self-awareness. As the workshop proceeds, each experience will layer on top of and integrate with the previous ones such that in the end, a new depth of sensing, moving and singing will be possible like never before. This workshop is appropriate for singers of all levels, voice teachers and choir directors. 4:30-6 Process – SECRETS IN THE BONES: THE BONES ORGANIZE THE MUSCLES,Discussion/Wrap-up.